High Quality Content by WIKIPEDIA articles! High Quality Content by WIKIPEDIA articles! 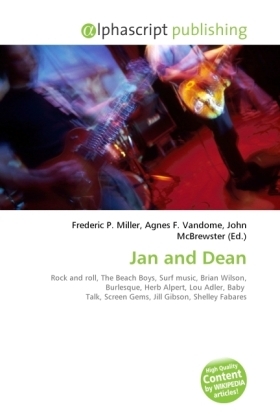 Jan and Dean were a rock and roll duo, popular from the late 1950s through the mid 1960s, consisting of William Jan Berry (April 3, 1941 March 26, 2004) and Dean Ormsby Torrence (born March 10, 1940). Although Jan & Dean pre-dated The Beach Boys, they became most famously associated with the vocal "surf music" craze inspired by The Beach Boys.